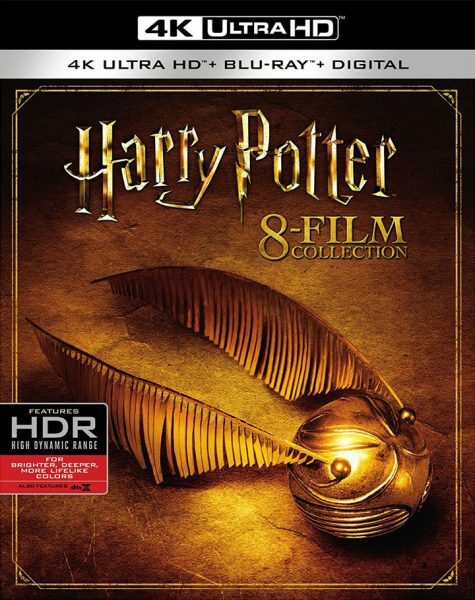 The entire Harry Potter film series will be releasing to 4k Ultra HD Blu-ray in an 8-film collection from Warner Home Video. With a run-time of over 1,500 minutes (which includes two extended edition movies on Blu-ray), the 16-disc edition carries a suggested retail price of $178.99 (see below for discounted Amazon pricing). This isn’t the first time Harry Potter films have been made available in 4k. The last four films to hit theaters were released on 4k Blu-ray back in March, and the remaining four will hit 4k Blu-ray the same day as the 8-film collection on Tuesday, Nov. 7th. The 8-film collection also includes digital copies of each film, which by the way will have to be redeemed by Dec. 31, 2018. Be sure to get that code authenticated right away or set your calendar for an alert before the end of 2018. Each Harry Potter film is presented in 4k 2160p resolution, with HDR color enhancements for 4k TVs that support the specification. And, audio is provided in DTS:X audio (backed by DTS-HD Master Audio 7.1).